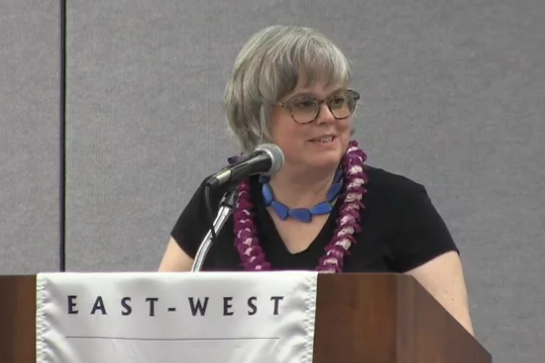 Editor's Note: Last week, Elizabeth was honored to give the 2017 George Chaplin Fellowship in Distinguished Journalism address at the East-West Center in Honolulu, Hawaii. Her prepared remarks are below and may differ slightly from delivery. Mahalo to the East-West Center and event co-sponsor Hawaii Public Radio for hosting. Thank you to the East-West Center, for this warm welcome. I've learned a little bit about George Chaplin in recent days. I spent the vast majority of my career in newspapers, up until joining NPR in 2015 — and I have been privileged to work with some extraordinary editors. They were tough and passionate, just as I've learned Mr. Chaplin was, as he built his newspaper into an important voice here in Hawaii. Thanks to Mr. Chaplin, this afternoon I am here to talk about a subject that I am sure would be of great interest to him – re-building public trust in the media. Because as you here at the East-West Center have rightly identified, we find ourselves at a time when numerous polls show that Americans are expressing unprecedented levels of mistrust and even dismissal of the media writ large. If you work in the media, you have only to read your Twitter feed every morning to know what I am talking about. And if you don't work in the media, you've no doubt heard the numbers, or at least read the panicky headlines that began in earnest last September. That's when Gallup, the polling organization, released the results of its annual survey of Americans' trust and confidence in the mass media "to report the news fully, accurately and fairly." The figures, which mirror those of other polling organizations such as Pew, were sobering: Just 32 percent of those polled said they had "a great deal" or "fair amount" of trust in the media. That figure had fallen eight percentage points in just one year, and marked the lowest level in Gallup polling history, since 1972, when Gallup first asked the question. And I'd note that poll was taken even before the November election, which has brought a whole new round of talk about whether the media can be trusted. Of whether we can fix this broken state. And if we can, at what cost? Or put another way, what is the cost to our democracy if we don't succeed? That last one is the real concern here. Not about media jobs, but the fear that democracy itself will suffer without a robust media. We have built our system on the premise that a vital media makes "enlightened participants" of its citizens and holds accountable our elected officials. I don't have a crystal ball. Most importantly I don't know what new technology is percolating in some Silicon Valley genius's brain or, for that matter these days, in the brain of some 12-year-old that could upend journalism and the way it reaches audiences in the same way that the internet — and more recently mobile technology — has wracked our business and our society in recent years. But as NPR's ombudswoman for the last two years I've had a fairly unique vantage point to observe some of these issues. In the questions that listeners and readers pose, I'm seeing some possibilities for solutions. In addition, new research continues to come out that is giving us better insight into what news consumers see as trustworthy journalism. There are steps that can be taken to rebuild public trust. It will most certainly be worth the time, the effort — and the cost. Today I want to take you through my thoughts on how we got into this situation. I'll look at some of the most immediate challenges we face, and what some news organizations are already doing to address the problem. And I will end with some ideas for how to foster rebuilding. Because I am fundamentally hopeful that we can come out stronger on the other side of this journey. To understand some of the possible solutions it's important to understand why Americans are expressing such unprecedented frustration with the media. Many of these factors that led us to this point are intertwined—it's hard to separate out the fast changing business model of media outlets from the larger societal changes taking place. What is cause — and what is effect — are not so easy to pick apart. And the problem has been decades in the making. We are talking about it more now but this goes back a long, long time. Let's start with some broad societal trends. Media organizations do not operate in a vacuum. Americans have been expressing declining levels of trust in many institutions for decades. I'll start with one example to illustrate how many institutions have undergone a reevaluation in the minds of many over the last several decades. I've been struck by a theme I see repeated in many analyses I've read and heard about this issue of media trust, which is the adulation heaped on the journalism of the late 1960s and early 1970s, a supposed high point in the country's relationship to the press. There was indeed some stellar journalism during that time; The reports on the civil rights struggles. The daring reporting from Vietnam and Watergate. But on second look overall this was a mainstream journalism that was dominated by white men; the few women and minorities at the time had to scrap for the plum assignments and space in the paper or on the air. It was a journalism heavily focused on the goings on in Washington. To many, this was not a journalistic nirvana. It was a club that excluded many talented people who could have expanded the conversation much more quickly. Americans have similarly re-evaluated other institutions. There is no blind faith in organized religion, public schools, or even science anymore. If Gallup's trust in media figures seem bad, consider this: in 2016, 9 percent – 9 percent! — of those they polled had "a great deal" or "quite a lot" of confidence in Congress. The Pew Research Center last week released its own polling on public trust in government that shows a similar pattern— Just two-in-ten Americans say they can trust the government in Washington to do what is right "just about always" or "most of the time." That is a near historic low. Bll Bishop, co-author, with Robert Cushing, of "The Big Sort: Why the Clustering of Like-Minded America is Tearing Us Apart," unpacked some of this last month in the Washington Post. His piece was headlined "Americans have lost faith in institutions. That's not because of Trump or 'fake news.'" He cites rising incomes, modernization, increased education, and technology as factors that have led inexorably to a prioritizing of individualism over the communal good for this decline in institutional trust. Americans increasingly think for ourselves – and about ourselves. Some other historical developments are worth singling out. The creation of the Corporation for Public Broadcasting in 1968 and the arrival of PBS and later NPR expanded the news offerings nationwide. PBS in particular was met with immediate distrust by the Nixon administration that was the target of some negative reporting. In 1987, the Reagan-era Federal Communications Commission abolished the Fairness Doctrine. That public policy had been in place since 1949, and required that holders of broadcast licenses for television and radio stations regularly provide multiple, opposing perspectives about important public issues. An earlier attempt to turn the doctrine into law failed when Reagan vetoed it, calling it "antagonistic to the freedom of expression guaranteed by the First Amendment." And with the rolling back of the doctrine, talk radio – most of it from the right — blossomed. The FCC also gradually began lifting the limits on the number of media outlets one company could own—Those limits were again expanded just last month. And this morning we got the news that Sinclair Broadcast Group—already the owner of the most TV stations in the country, is buying another large group, Tribune Media. As media groups got bigger, their voices were amplified. Some of those were partisan voices. Technological changes played a role too, as news flourished in a rapidly growing cable infrastructure. And those outlets increasingly found a business model in partisanship. Most notable among these was Fox News, founded in 1996, which built its business playing to conservative misgivings about mainstream news organizations, misgivings that had been nurtured over the years by deep pocketed individuals working through think tanks to foment distrust of the media, for political advantage. In that Gallup poll from last year that showed an overall trust in media of 32%, the figure was a mere 14 percent among Republicans. And of course news organizations themselves must shoulder some of the blame for declining levels of trust. In his Washington Post article, Bill Bishop talked about some straightforward historical reasons why institutions have lost influence. But what also caught my eye were the comments on that piece. The commenters didn't really care about history. They wanted to point blame at the media for its own demise, going all the way back to Dateline NBC's fake explosion of a GM truck to illustrate a 1992 story about safety defects. That was 25 years ago. Media organizations have gotten big stories wrong. The false reports that there were weapons of mass destruction in Iraq leading up the 2003 invasion. Last fall's election reporting that was underpinned with an assumption that Hillary Clinton had the presidency locked up. Other decisions played a role in fostering distrust, too. Cable networks that prioritized talking heads over reporting. Print media that conflated opinion, analysis, and straight reporting. It's all of a piece: policy, technology, changing society, business decisions, and just plain errors. It all led to a place where news consumers began drifting to ideological corners, trusting some media that reflected their own views, distrusting others. We will never know how these tendencies would have played out had it not been for the twin technological thunderbolts—the internet and mobile technology. The arrival of the digital era not only roiled journalism's business model — it accelerated these societal trends — and abetted a whole other level of distrust of media. Facebook encouraged the news bubble situation last year with its algorithmic serving up of red and blue news feeds, so users only saw their views reinforced, with little in the way of counterargument. Was this a political act? No, just a business one designed to increase clicks. Even one of my favorite former editors succumbed to the temptation the other day. I'll spare him the embarrassment by not naming him but he posted a story with the intro "Who knows if this is true... but this certainly fits in the pattern." He was quickly called out and took the post down. This news phenomenon – news we agree with being seen as somehow not worth verifying and a tendency to label "untrustworthy" the stories that go against our own beliefs — is separate from the entire other category of fake news – deliberately false stories, many manufactured overseas by people looking to make a quick buck off the digital hits. Yet another class of fake news appears to be coming from agent-states seeking to influence elections. An Oxford University study showed that Twitter users in Michigan—a battleground state in the 2016 presidential election—received as much fake or untrustworthy news between Nov. 1-11 as they did professional news content. The business ramifications of the digital onslaught took a toll, too. Take copy editing. As the profitability of print media outlets dropped in the switch to digital, one of first groups of employees to feel the effects was the copy editors. Those wonderful employees whose role in the newsroom is to uphold standards and practices, to save reporters from misreporting the facts, to cast that final critical eye looking at nuance in headlines. Their ranks have been dramatically thinned. The result is obvious to anyone who reads a newspaper or web site. Errors are up, from the misplaced apostrophe in "it's" to dropped words, misspellings, and worse. Can something as simple as firing copy editors make a difference? Well, when the Media Insight Project — an initiative of the American Press Institute and the Associated Press-NORC Center for Public Affairs Research — asked Americans last year the most important factor inspiring their trust in a news organization, the answer was "accuracy." Getting the facts right. A more severe effect of the digital era has been the culling of local newspapers: the Seattle Post-Intelligencer; the Rocky Mountain News; the Cincinnati Post, the Albuquerque Tribune and more. Other papers such as the Flint Journal have survived but only publish a few times a week. The newsroom at one of my alma maters, the Los Angeles Times, has shrunk from more than 1,200 people in 2001, when I was there, to about 430 today. Entire swaths of rural areas are without local newspapers. Big national news organizations have benefited as a result. But those organizations are coastal-based, in urban multi-cultural locales. POLITICO's Jack Shafer and Tucker Doherty posted eye-opening research last month that confirmed in stark terms just how much of their own bubble national news journalists are living in these days, They live on the coasts in liberal and Democratic enclaves. Shafer wrote, "If you're a working journalist, odds aren't just that you work in a pro-Clinton county—odds are that you reside in one of the nation's most pro-Clinton counties." I remember clearly the first time I went back to a high school reunion in mid-Michigan and heard an earful from a dear friend about how New York based journalists were not speaking to her issues. That was 20 years ago and the divide has only gotten wider. Many journalists I know recount similar experiences. So! After painting such a bleak picture you might ask—why do I remain optimistic? Partly it's because some very smart minds are throwing themselves at the situation in order to understand it better. It is certainly a preoccupation of the journalism profession these days. And I don't mean the many speeches –like this one — and panels that have been devoted to fake news, journalism ethics and the war on the media. When the list of next fall's Nieman fellows came out last week — these are the fellowships that allow journalists to spend an academic year at Harvard University — a full one-fourth of the 24 research projects dealt in some way with this issue of distrust in the media, and how to solve it. They will join many projects that are already underway. Wikipedia founder Jimmy Wales last month announced a new WikiTribune, a news service, to be built on the work of both professional journalists and volunteers, that will provide free, donation-supported "factual and neutral" articles." "...how journalism can stand out from the chaotic [digital] crowd and signal its trustworthiness. The project crafts tangible digital strategies to fulfill journalism's basic pledge: to serve society with a truthful, intelligent and comprehensive account of ideas and events. ...bake the evidence of trustworthy reporting — accuracy, transparency and inclusion, plainly into news practices, tools and platforms." Or in short: how can news organizations communicate quickly to news consumers that a story was ethically produced. How to then communicate this to the public is another step. One suggestion has been to add a button — a sort of Good Housekeeping Seal of Approval, if you like — to digitally shared stories that are ethically produced. Another way to think of that is in terms of marketing. Perhaps trustworthy news organizations need to do a better job of selling ourselves, making a case for why we are more reliable. We follow best practices. We correct errors quickly. And yes, we have ombudsmen, public editors, who are paid as in-house critics. We certainly need to invest in more news literacy. Over and over I hear from journalists at NPR member stations about how some listeners have no idea how stories come together, the rigor with which reporters approach a topic, the fact checking, the levels of editing. As Damian Radcliffe of the University of Oregon notes, better labeling could help too—what is reporting, analysis, commentary? Or sponsored content from advertisers? Let's talk about fact checking. The 2016 campaign coverage had many problems, but one highlight was the doubling down at many news organizations, including NPR, on fact checking. Yes, some news consumers are overly quick to see partisanship in the facts that are checked. But overall, these news tools are adding to the movement towards transparency, which many smart minds argue will be a key element in rebuilding trust. Jimmy Wales' new WikiTribune is essentially this in a nutshell. Show me your work, not just the answer, as they tell kids in middle school math classes. Annotate each statement in your story with supporting documents. Taking it a step further, tell us the questions you asked. How did you reach your conclusions? Tedious, yes, and antithetical to the more! faster! news culture of today. But worth it? My guess is yes. I also see a bright spot in deeper research that drills down beyond the very broad question of trust in media. What's really important is which media do you trust, or not, and why or why not? That is something that news organizations can work with – and already are. Reacting to the devastating effects of the news media's contraction in the last decade, foundations such as Lenfest are investing in tools to support local media. The Center for Cooperative Media is working to bring about local - national news partnerships. NPR itself has a new initiative to help local stations cover statehouses and state governance issues in three dozen states. Jim Brady's Spirited Media is rolling out innovative local digital news operations in three cities so far: Philadelphia, Pittsburgh and Denver, all places that have lost newspapers to the digital onslaught. After being blindsided by the 2016 election results news organizations are realizing they need to hire more staff that are not based on the coasts. More reporters with diverse backgrounds: ethnically diverse, racially diverse, from diverse economic backgrounds, and yes, of diverse political thought. NPR, to take the example with which I'm most familiar, is not only working with stations on statehouse reporting. It is ambitiously embarking on a three-year plan to more closely integrate the newsgathering of its member stations in hundreds of communities nationwide with that of the national NPR newsroom, whose journalists are clustered primarily in D.C., N.Y., and Los Angeles. There are huge hurdles to overcome but the potential is dramatic: A national news organization that has hundreds of eyes and ears across the country, attuned to the residents of this country. And the stations themselves are news organizations where citizens can potentially find common ground and meet in a more trusted venue. It is a bold move, but that's what the situation calls for. Finally back to my point about copy editors. When I first read that API poll that showed basic accuracy is the main element of trustworthy journalism it seemed so obvious that I was a bit baffled. Of course accuracy counts. Isn't that what is drilled into journalists from day one? But the more I thought about that the more I thought perhaps it offered a glimmer of hope. Those polled weren't saying they didn't like the narrative being expressed, or that they felt there were too many stories devoted to one topic and not enough to another (those came further down on the list) They simply wanted the basic facts to be accurate. So if one element of rebuilding trust is really as simple as improving our accuracy then that is a pretty easy fix. Put in some quality control. Get back to basics. Yes, it will cost a little more. Will these steps be enough? There are certainly plenty of counter-arguments to be made. We will not ever get back to an era of blind faith in the media. In this intensely partisan era there are some news consumers who likely just won't be swayed. They have gone to their corners and they aren't coming out for anything. Their suspicions and distrust run too deep and they are not interested in a news organization that presents perspectives that differ from their own. That's frustrating because rebuilding trust will take some good will and concerted action on the part of consumers of media. It's a partnership. Platforms such as Facebook will need to do their part, as well. That said, I believe many news organizations have heard the message and are taking steps to do their own part, assuming technology does not blindside us once again. I have been saying frequently these days how privileged I am to have my role at one of the most interesting times for journalism. We are thinking through how we approach everything in our jobs. In some cases that means re-evaluating our traditional way of doing things. In other cases we are putting our heads down and getting back to some key basics of our profession that perhaps we have strayed from. We are thinking more creatively about how we reach audiences and how to approach our role with rigor. Are the challenges robust? Absolutely. But as part of the global community you appreciate that it's important that we get this right. That trust in a vital media ecosystem is one of the underpinnings keeping our democracy strong.